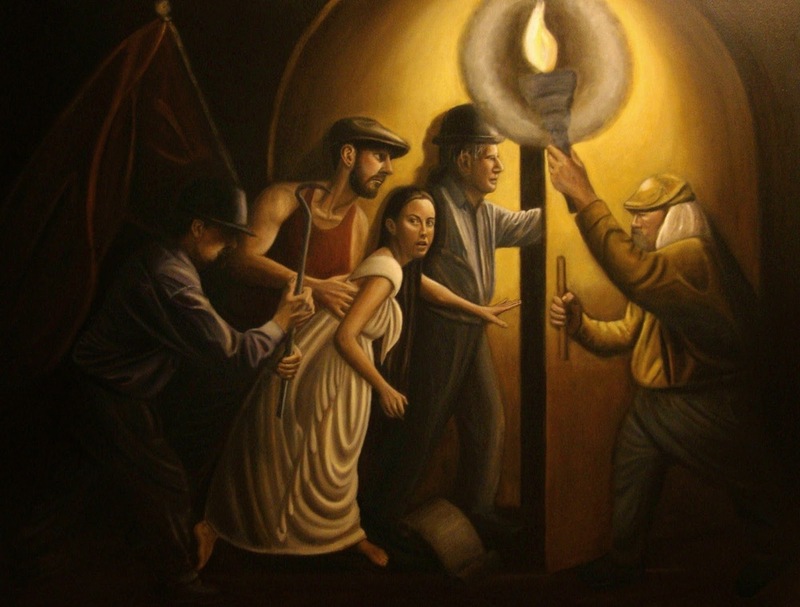 The (In)humanity Triptych re-signifies three biblical narratives in light of the Holocaust. 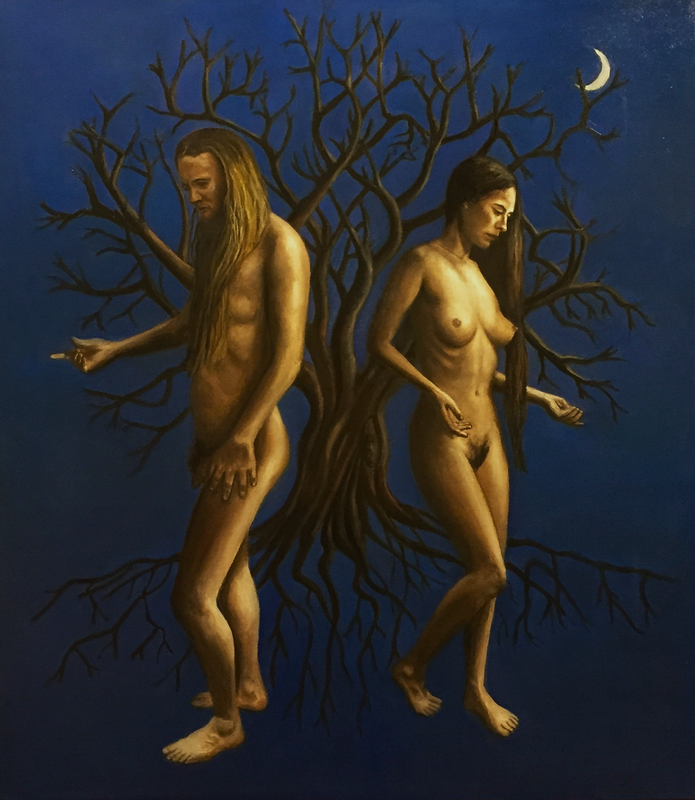 In The Expulsion Adam and Eve witness the future of their progeny and world, and the creation of humankind is tainted with the symbols and horrors of the death camps. 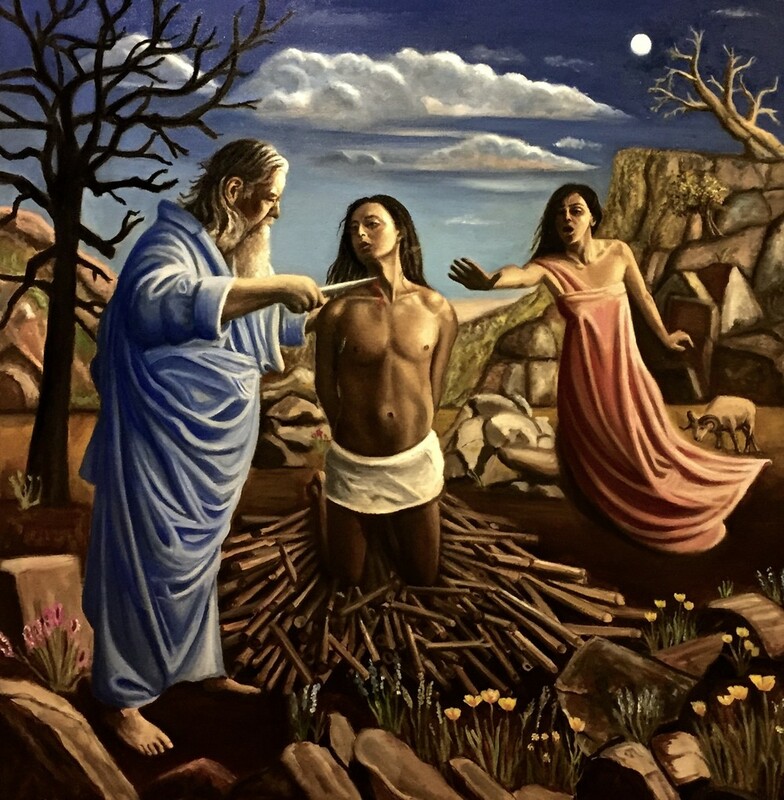 The Sacrifice, the middle panel of the triptych, references the sacrifice that Noah made after the destruction of virtually all humankind in the flood and provides a window into the Nazi crematoria. 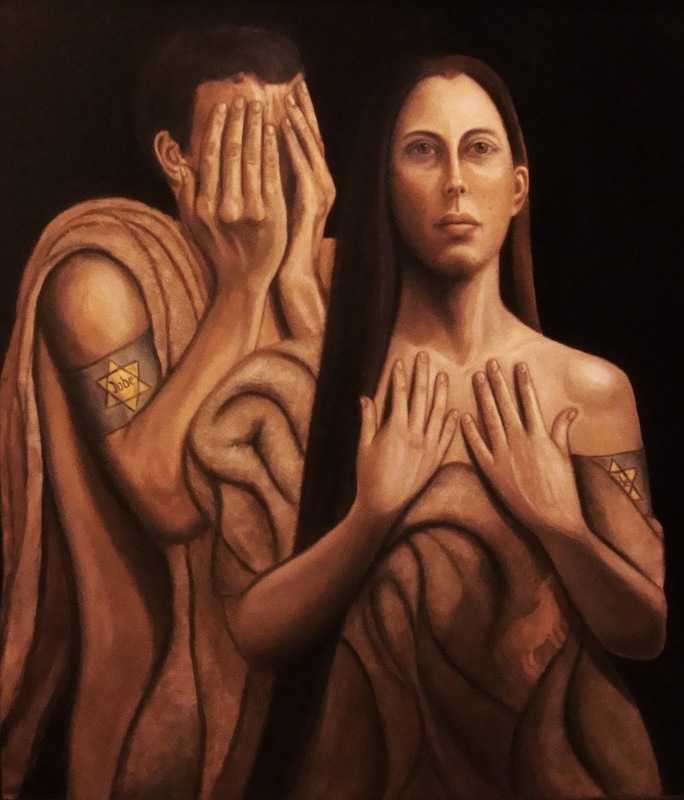 Finally, The Accusation both recalls Queen Esther’s confrontation with the wicked Haman (who sought to destroy the Jewish people) and calls the viewer to responsibility and action in the face of humanity’s recurring inhumanity. Further images and discussion of the (In)humanity Triptych can be accessed at inhumanitytriptych.blogspot.com. The Murder of Hypatia/Death of the Anima Triptych reflects upon the brutal assassination of the one female philosopher who is known to us from antiquity, Hypatia of Alexandria. According to the account of Socrates Scholasticus, Hypatia, who taught in Alexandria Egypt in the 4th century, was kidnapped by an angry mob of men and brought to a Church called Caesareum, where she was stripped and brutally murdered with tiles. The triptych raises the question of men’s intolerance of an intellectual woman, and the intolerance of the feminine within themselves. The first panel depicts Hypatia Contemplating a Bust of Plato, and the second, The Murder of Hypatia depicts the kidnapping prelude to her assassination. 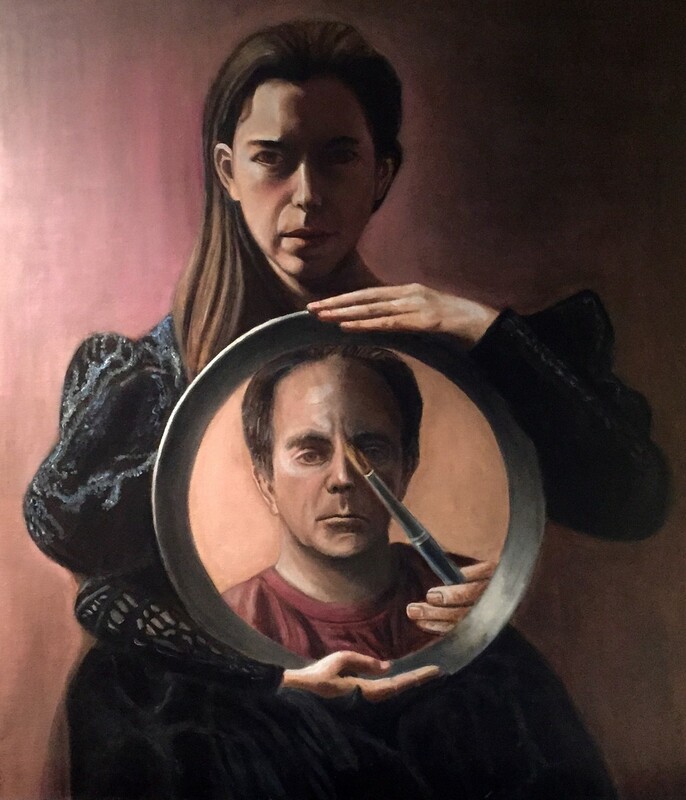 The final painting, Hypatia’s Mirror, is a self-portrait of the artist in a mirror held by Hypatia subsequent to her murder, and graphically depicts the artist’s own reflection upon his attitudes toward the feminine. 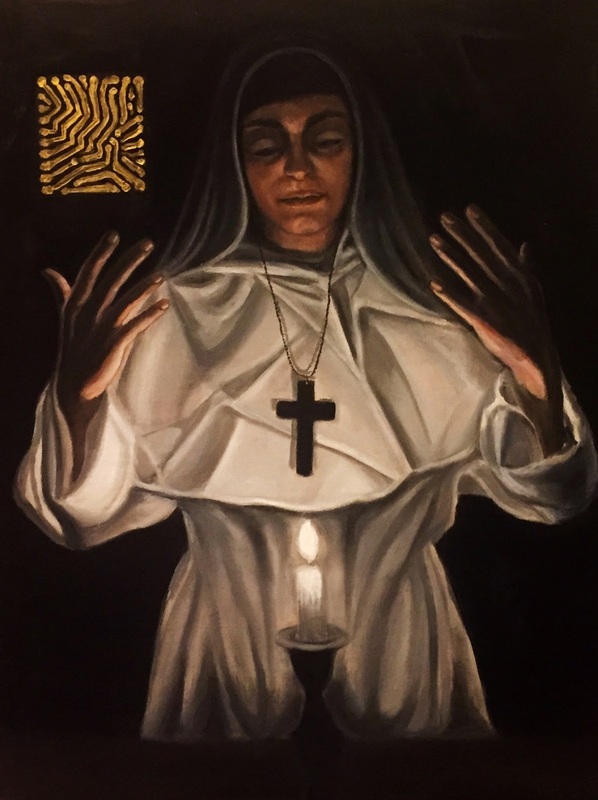 The viewer is, in effect, invited to look into “Hypatia’s Mirror” as well. Further images and discussion of The Murder of Hypatia/Death of the Anima Triptych can be accessed at hypatiapainting.blogspot.com. A Midrash on Time illustrates an apocryphal story, written by the artist. In this story a hitherto eternal Adam and Eve (Before the Birth of Time) are granted the smallest measure of time in order to participate in a hearing before the divine council on the wisdom of introducing temporarily into an originally timeless world. 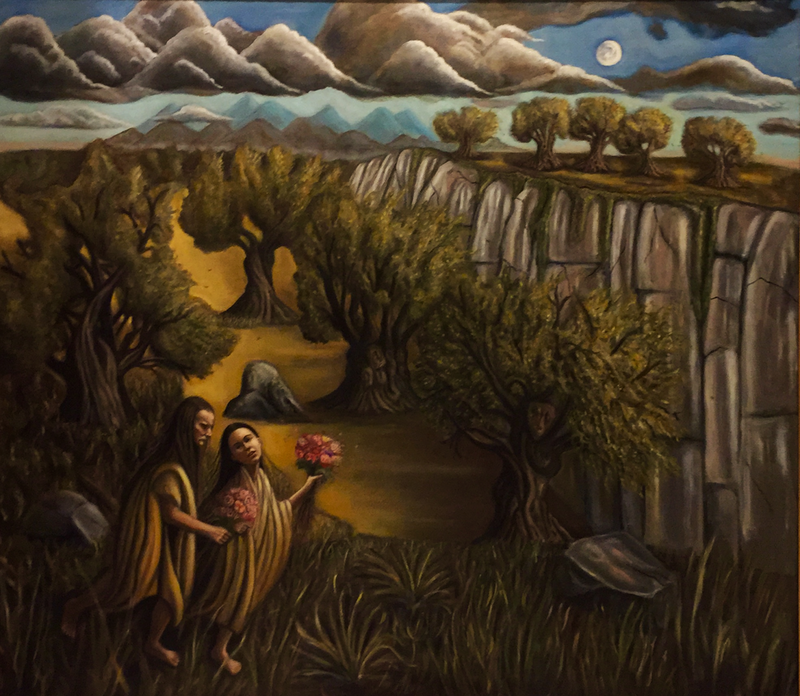 Intoxicated with the possibilities of having even the smallest measure of time, Adam and Eve flee into a world of “olive trees, trees, cliffs and stones” (The Flight Into Time) only to be confronted with their own mortality (The Death of Adam). Further images and discussion of A Midrash on Time can be accessed at midrashontime.blogspot.com. 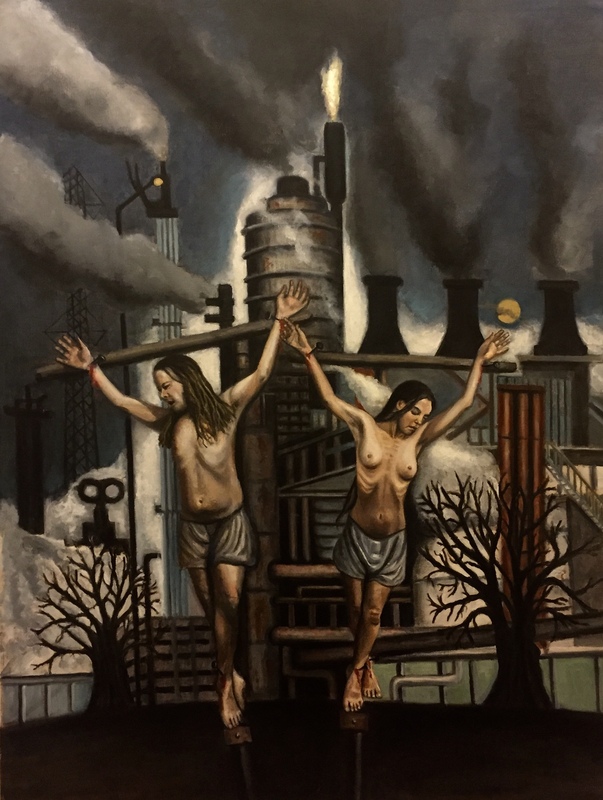 The Posthumanity Triptych, which consists of A Simulated Rabbi, The Crucifixion of Adam and Eve in New Jersey, and A Simulated Sister, raises the question of the fate of religion in a world where only computer-simulated “rabbis” and “sisters” remain after the destruction of humanity as a result of environmental catastrophe. Further images and discussion of The Posthumanity Triptych can be accessed at posthumanitytriptych.blogspot.com. 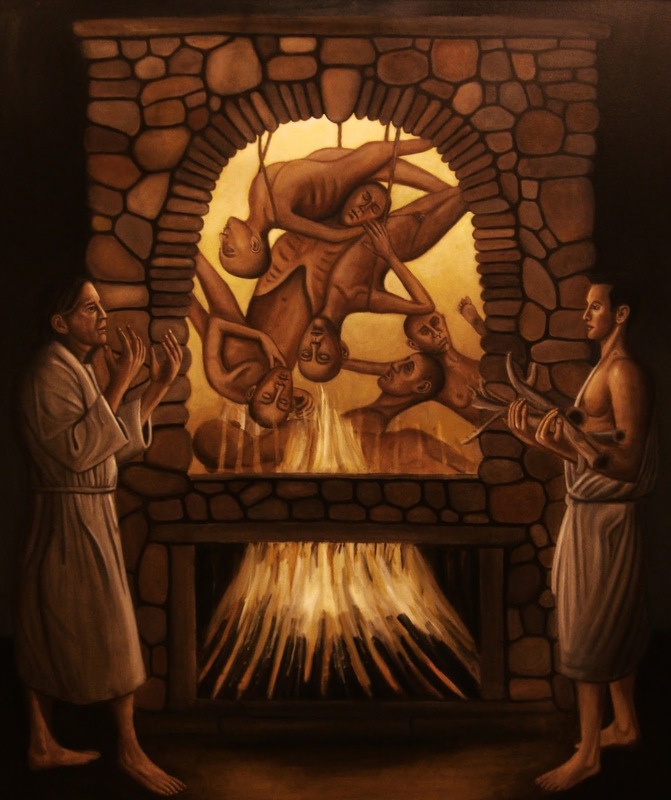 These paintings depict the Akedah from the perspective of midrashim which narrate that Isaac was actually sacrificed by Abraham on Mount Moriah. The oil paintings are in process.